Salmanzadeh H. Hospital administration & efficiency at teaching hospitals affiliated with Iran University of Medical Sciences. Journal of Health Administration. 2001;4(8):1-11. [Persian]. Walley T, Haycox A, Boland A. Pharmacoeconomics. Philadelphia: Elsevier Health Sciences; 2004:11-12. The main economic indicators. Central Bank of Islamic Republic of Iran website. http://www.cbi.ir/. Accessed May 5, 2012. Published 2012. Davari M, Walley T, Haycox A. The Iranian health insurance system; past experiences, present challenges and future strategies. Iran J Public Health. 2012;41(9):1-9. Castano R, Bitran RA, Giedion U. Monitoring and Evaluating Hospital Autonomization and Its Effects on Priority Health Services. Partners for Health Reformplus. Bethesda: Abt Associates Inc; 2004. Karami matin B. 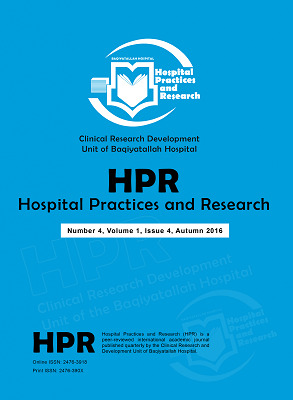 A Study of General Teaching Hospitals Efficiency at Kermanshah University of Medical Sciences. Journal of Health Administration. 2001;4(8):30-39. [Persian].